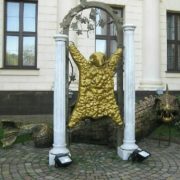 First of all, this is a Golden Fleece monument installed in front of the New Athos Cave – famous natural landmark of Abkhazia. 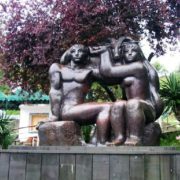 A very well-known Abkhaz sculpture, about which, however, we do not know much – neither the author nor the year of installation. 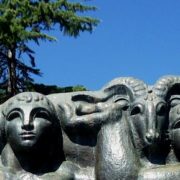 Noteworthy, the myth of the Golden Fleece reflects the history of the first relationship of ancient Greece and the Caucasus. Besides, opened to visitors in 1975, Athos Cave got its name from the holy Mount Athos in Greece. 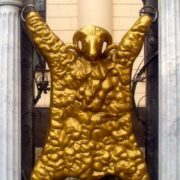 And, together with the sculpture of the Golden Fleece, they are a popular destination for tourist excursions. Meanwhile, next to the building through which you can get into the cave, appeared a statue of the Golden Fleece. It symbolizes the ancient legend about the journey of brother and sister Phrixus and Hella on the golden ram to the shores of Asia. The golden skin of sacrificed animal became a symbol of prosperity. However, later, Jason and the Argonautsand stole it. Another assumption of the significance of the Golden Fleece in the Caucasus – is an ancient way of getting gold in the mountain rivers. In particular, by immersion of lamb skins, on which precipitated the gold particles. 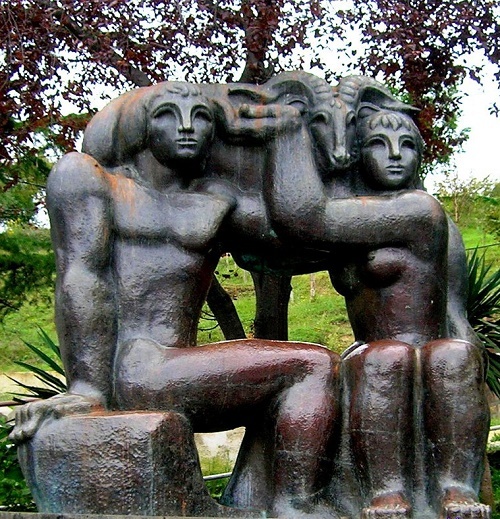 Fortunately, we know more about this monument to Golden Fleece know more. It appeared on the Square of Arts at the Art Museum in the Central district of Sochi. Between the graceful columns stretched gold sheep skin. In addition, the fearsome dragon protects the precious skin. 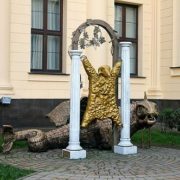 The author of “Black Dragon” – sculptor Yakov Matusovsky created the composition of the “Golden Fleece” in co-authorship with director of the Sochi Art Museum Pyotr Khrisanov. Although they created the sculpture in 2005-2006, it was installed in January 2008. The total weight of the composition – 5 tons. 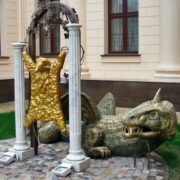 By the way, since the element representing the fleece – covered with gold leaf, the authorities couldn’t trust its protection exceptionally to the dragon. That’s why, the monument is under the clock security cameras.